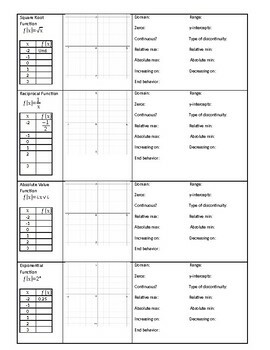 Characteristics of Parent Functions - Student-Completed "Cheat Sheet"
This resource is a reference for the characteristics of parent functions that students fill-in themselves. 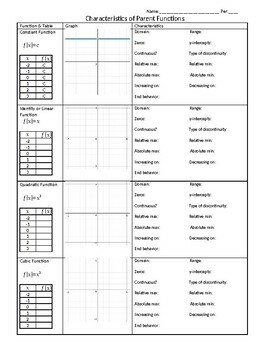 They can use what they know about describing functions to make a useful "cheat sheet" with information about the constant, linear, quadratic, cubic, square root, reciprocal, absolute value, and exponential parent functions. This is good practice and since students complete the reference sheet themselves, they are better able to remember and understand. It is a fully editable word document so you can change it to fit your needs if you wish.